Eighty-four. That's how many inches are in seven feet. While they're the same size, one is definitely more impressive than the other. Being 84 inches sounds a bit underwhelming—like you're cutting a two-by-four. Being seven feet tall sounds cool—like you're a basketball player. There are 43 players in the National Basketball Association that are at least seven feet tall. Fourteen of those players are seven-foot-one or taller. Five teams don't possess a seven-footer, and one, the Boston Celtics, doesn't have a player 6'11" or taller. That doesn't seem to bother the C's. At the time of writing this article, they have the best record in the Eastern Conference. Of the 25 teams with at least one seven-footer, 12 have two or more and 6 have three (Mavericks, Lakers, Suns, Trail Blazers, Kings, and Raptors). Of the 43 players listed at seven feet tall, all but two are listed at center, either partially or fully (five are listed at forward-center and four are listed at center-forward). The two seven-foot tall forwards are Dragan Bender of the Phoenix Suns and Lauri Markkanen of the Chicago Bulls. The leagues 43 seven-footers represent 24 countries including Austria, Cameroon, Finland, and Tunisia. The countries with the most entrants after the United States is Spain and Croatia (each has two). The heaviest seven-footer is Boban Marjanovic of the Detroit Pistons. He's listed at 290 pounds. We find it hard to believe that not a single seven-footer is three bills. Remember, this isn't a list of height but listed heights. NBA players are usually an inch or two shorter, and 10 to 15 pounds heavier, than what's officially claimed. Our first NBA player heights list documents each team's tallest player(s). After that, we list the NBA's 43 seven-footers. For that rundown, we've organized players by height, and within each height, we've listed the players alphabetically by team. For teams with more than one seven-footer, we listed them alphabetically. To qualify for our list, a seven-footer needed to appear in at least one NBA game during the current season. The Detroit Pistons have a 7'3" player named Kristaps Porzingis and the other team with a 7'3" player is the New York Knicks with Boban Marjanovic. The team with the next tallest player is on the Dallas Mavericks named Salah Mejri at 7'2". The former USC Trojan is currently averaging 11 points and 8 rebounds a game. Baynes and Horford have more in common than just their height. Both were born in 1986. The Russian is one of 11 players that are listed at seven-foot-one. Combined, Zeller and Kaminsky are 14 feet tall and averaging 19 points a game. Lopez and Markkanen see eye-to-eye, but they are separated by nearly a decade of experience. Lopez entered the league in 2008 and Markkanen is a rookie. The Cavs don't have a seven-footer, but they do have two guys that are 6'11" and another that's 6'10" (Kevin Love). 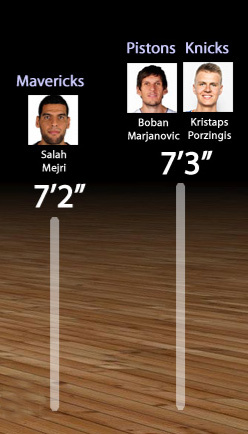 Mejri is the only player in the NBA that's listed at 7'2". The only other height that is represented by just one player is 5'10" (Tyler Ulis). The 17 other heights are represented by at least two players. Mason's brother Miles Plumlee is 6'11". His other brother, Marshall Plumlee, is 7'1" and plays in the NBA G League. Their poor mother. The Serbian center is tied with Kristaps Porzingis for the NBA's tallest player. Jones barely makes our list. He got into one game and played for less than two minutes. Zhou Qi is not the tallest Chinese player to ever make the Rockets roster. The 7'6" Yao Ming played eight seasons for Houston and helped popularize the game in his homeland. Domantas's father, Hall of Famer Arvydas Sabonis, played for the Portland Trail Blazers in the late 1990s and early 2000s. Pops is 7'3". The Clippers lack a seven-footer, but they have five players 6'10" or taller: Jordan, Brice Johnson, Danilo Gallinari, Blake Griffin, and Willie Reed. The Lakers other two seven-footers are Andrew Bogut and Brook Lopez. Marc towers over his older sibling, Pau. Big bro is the runt of the family standing at just seven feet. Both Whiteside and Olynyk are averaging double-figures in scoring. Whiteside is putting up 14 a contest while Olynyk adds 10. Thon Maker hails from South Sudan. Towns is the third leading scorer, and leading rebounder, for players standing at least seven feet tall. Asik was born on the 4th of July. Not a big deal for him since he's from Turkey. The 22-year-old, who is tied for being the Association's tallest player, is averaging 23 points a game and pulling down seven boards. Adams was the 12th overall pick for the Thunder in 2013. Playing 30 minutes a game, the Montenegrin center is contributing a solid 17 points and 9 rebounds. The former Kansas Jayhawk might be the best seven-footer in the NBA. He's averaging 24 points, 11 boards, and 3 assists a game. The Suns are the only NBA team with more than one player who's 7'1" or taller. At practice, Leonard looks down at his teammates Jusuf Nurkic and Zach Collins. Both are only seven feet tall. It's a good thing that Papagiannis has a seven-foot-one-inch frame. Otherwise, his last name might not fit on the back of his jersey. Pau Gasol, 37, is not the tallest seven-footer in the NBA. That honor falls to Dirk Nowitzki, 39. The Raptors three seven-footers all contribute although Nogueira doesn't get a ton of minutes. Jazz fans have seen taller. Mark Eaton was 7'4" and played in Salt Lake City in the eighties and early nineties. Twice, he won Defensive Player of the Year honors. The Wizards are famous for height. The two tallest NBA players of all-time, Manute Bol and Gheorghe Muresan, both played for Washington. Each man was listed at 7'7".